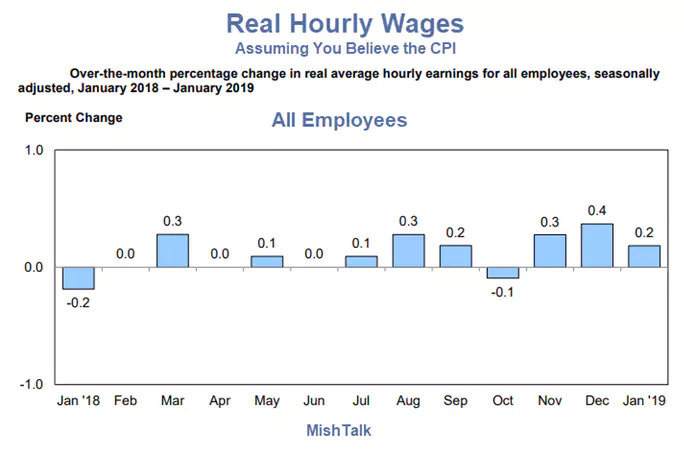 In the past year, real wages rose eight months, fell once, and were flat three times. Please consider the BLS' Real Earnings Report for January 2019. Real average hourly earnings for all employees increased 0.2 percent from December to January, seasonally adjusted, the U.S. Bureau of Labor Statistics reported today. 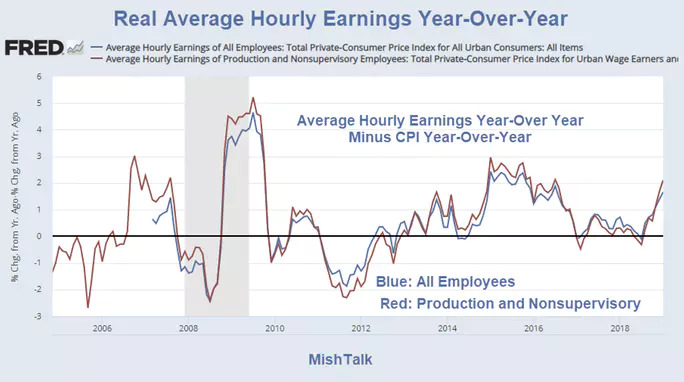 This result stems from a 0.1-percent increase in average hourly earnings combined with no change in the Consumer Price Index for All Urban Consumers (CPI-U). Real average weekly earnings increased 0.1 percent over the month due to the change in real average hourly earnings combined with no change in the average workweek. Real average hourly earnings for production and nonsupervisory employees increased 0.2 percent from December to January, seasonally adjusted. This result stems from a 0.1-percent increase in average hourly earnings combined with a 0.1-percent decrease in the Consumer Price Index for Urban Wage Earners and Clerical Workers (CPI-W). Real average weekly earnings increased 0.2 percent over the month due to the change in real average hourly earnings combined with no change in average weekly hours. Early today, following the CPI release, I noted CPI Flat 3rd Consecutive Month, Year-Over-Year Down 3rd Month. Anyone seeking to buy a home knows the shelter index is a flat out joke. 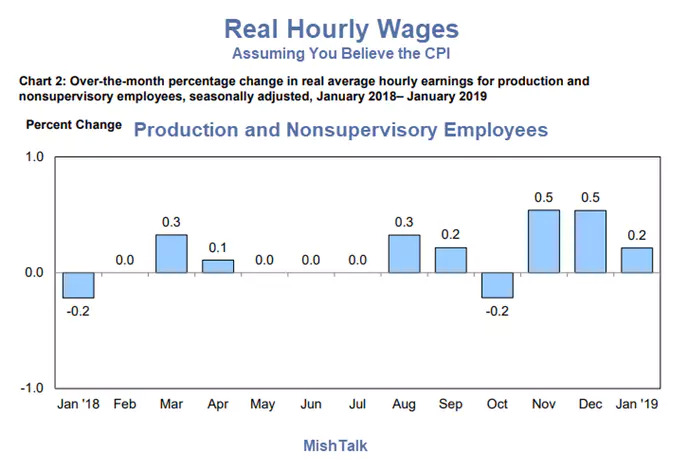 To provide a better long-term picture, I put that chart together by subtracting the appropriate CPI from average hourly earnings. The CPI deflator is CPI-U for everyone and CPI-W for production and nonsupervisory workers. Prices that cannot be accurately measured in the first place are further hedonically modified to provide some sort of average as if that makes any sense. In terms of wages, it's not the average that matters but the median. We get those numbers on a two-year lag. Realistically, most of this is a joke.